Our Naked Sauerkraut combines raw fermented cabbage - a source of probiotics - with a pinch of salt for a great, zingy taste. Try some Living Goodness today. Life is better when you’re naked. And so is sauerkraut! Stripped of crazy preservatives and artificial flavours, all you’re going to find in this fermented food is some tasty cabbage and a pinch of Himalayan salt. 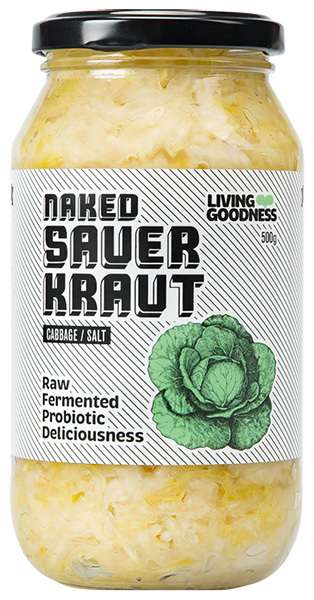 As naked as the day it was born and fermented with live probiotics, this raw sauerkraut is full of goodness. And it tastes great too. Get naked today! Serving Suggestion: Naked Sauerkraut is a delicious condiment for any meal. Our taste testers recommend enjoying it with cured meats, goulash, pork sausages, pickles, salads and cheese. Or even straight out of the jar in its pure, naked form. Enjoy!